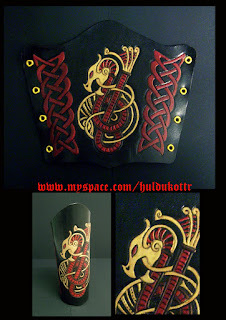 HULDUKÖTTR - Norse and Germanic Art: Golden Dragon Bracer. More bracers. This is a step forward in our designs, because this one is painted with gold tincture. We must say that gold tincture is not the same as golden tincture, because the gold one is made from real dust of gold.